Every flybridge on every boat I've had in my life was an add-on, removable entity. But not on my MT 34 sedan! 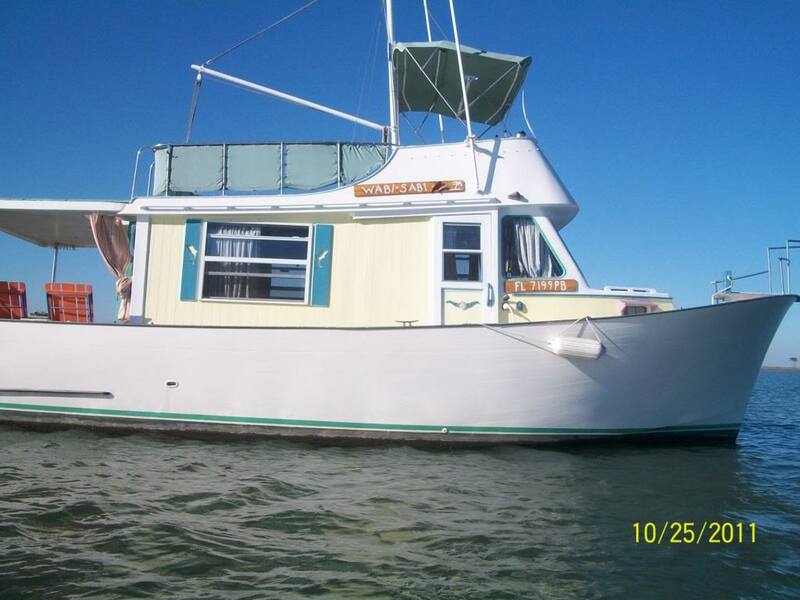 Now reviewing the probability of bringing the ol' gal home, well... man, I'd sure hate to have to cut off my flybridge! Anybody deal with this before? Or do I just whip out the ol' Sawz-all and go to town? Oh, and I'd post a pic, but this won't let me add a link from picasa web albums.... It's just not my day. It might help out some if we knew the location your attempting to haul to and from. 13'-8" max tells me I'd try a different haul guy if you are anywhere in the western US. It's not at all unusual for oversize loads to go around bridges they can't get under. I have heard of flybridges being sawed off but only as a last resort. I have yet to see a boat where the fly bridge was not simply installed on top of the PH overhead deck..
As such it will need perioditic removal to rebed/ reseal anyway . And if you have to take it off to haul it home, then take it off to haul it back, not something I'd consider. What are your plans after the repair/replace/rebuild time span? Sawzall....several trawler owners including myself have glassed our bridges to the cabin top. My vote...sawzall...the damage is easily repaired. I brought LP from florida by ship after finding they could not haul it by truck without removing the fb..which also involves disconnecting the steering station et al up there...electrics, hydraulics, hand rails! the cost was about 2x that of hauling and but enormously more boat friendly. 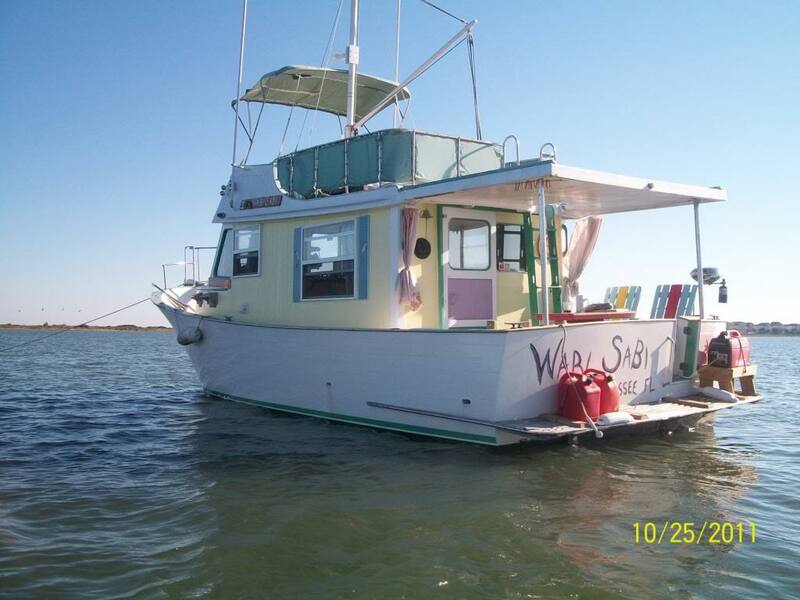 shipping by boat is much more common than you might realize...I negotiated my cost down by $10k though and they stuck it in a small space behind a 140ft boat as a filler but hey...I`m not proud!! Yup, for you nonbelievers I figgered out how to download a picture of Wabi Sabi.... Isn't that insane? Obviously it didn't register when we picked her as our new project. We plan on Looping in 5 or so years, but will probably splash her before that. Maybe 3 years on a refit here at home. No schedule. All systems, except the engine/drivetrain (God Bless Lehman!) need TLC and the thought of having her 15' from my workshop... Man, o, man! It'll be worth cutting off her bridge. Footnote: Me wench got her motorcycle endorsement at the age of 50 (I've been riding 40 yrs) so we've drifted away from the boating lifestyle (I was live-aboard trawler trash in SoFLA about 4 yrs, lost my Eagle 40 in Hurricane Charley) and we've been touring the 2-lanes for yucks and giggles lately. That and rain EVERY FRIGGIN DAY this last summer... So, alas, our old boat's been lonely and neglected. Time to bring her home.